All About SharePoint, InfoPath, and SharePoint Designer! 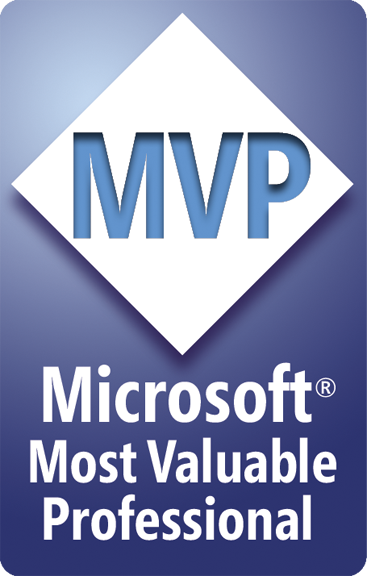 MSDN Forums SharePoint Task Force – A Call to Arms! You all know how much I like InfoPath, so you probably know how much it pained me not to be able to provide InfoPath forms to anonymous users in SharePoint 2007. For one, you don’t want to use a Filler form, because it’s a guarantee that not every anonymous will have InfoPath installed locally. However, even if we used browser forms, anonymous users are not allowed to submit documents. There are some permissions hacks for working around that to some degree, but they are not recommended. There is another method where you can set up a web service submit to use the Lists.asmx web service for submitting the data from the form to a list without actually submitting the InfoPath document (XML). S.Y.M. Wong-A-Ton has a great article showing 5 ways to submit to lists from library form templates: 5 Ways to submit an InfoPath form to a SharePoint list. 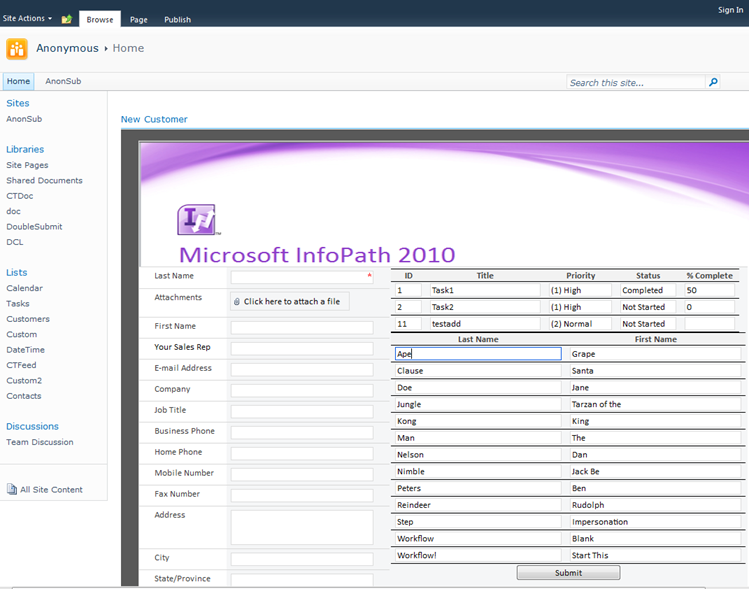 So, the good news is that we now have a brand new feature in SharePoint 2010 that allows us to utilize InfoPath as LIST forms. This is an amazing new feature, because people have been customizing their ASPX list forms for years with SharePoint Designer, but it was nowhere near as easy nor as powerful as using InfoPath; however, there was no way to use InfoPath directly for list forms. That has all changed, because now we can do it. Because of this, we can also allow our anonymous users to submit customized InfoPath forms without any custom web services, without the need for code, without any permissions hacks, and generally without any fuss at all. In this blog post, I am going to show you how – it’s very easy. ***Warning: InfoPath list forms are ONLY available in SharePoint Server 2010 Enterprise, because they are considered browser forms. Of course, this is the same for library-based browser forms, so this would be no different if trying to use library forms. First, you need to enable anonymous access at the Web Application level by browsing to Central Administration > Application Management > Manage Web Applications. In this example, I have a new web application named “Anonymous,” and I have set it to allow anonymous access (Fig. 1 and 2). 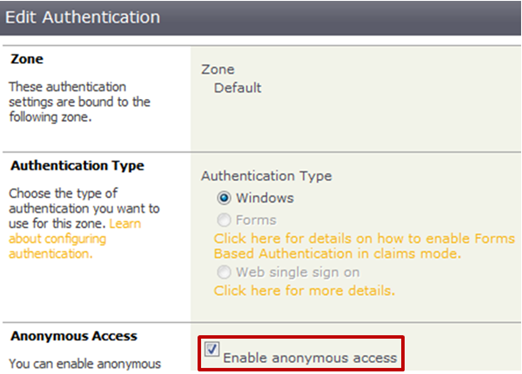 Next, you need to enable Anonymous Access on a site within the above web application. If you created a new web application, then create a new site collection. If you modified an existing web application, then either create a new site collection or browse to a site on an existing site collection. Once you decide where you want to test this, browse to that site and click Site Actions > Site Permissions. Then, click the Anonymous Access button in the ribbon (Fig 3). This is just an everyday activity in SharePoint, but we need it in order to show the solution. 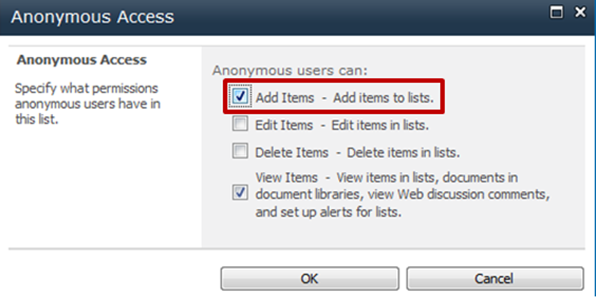 Now, your anonymous user should be able to add an item to the Customers list (Fig. 12). 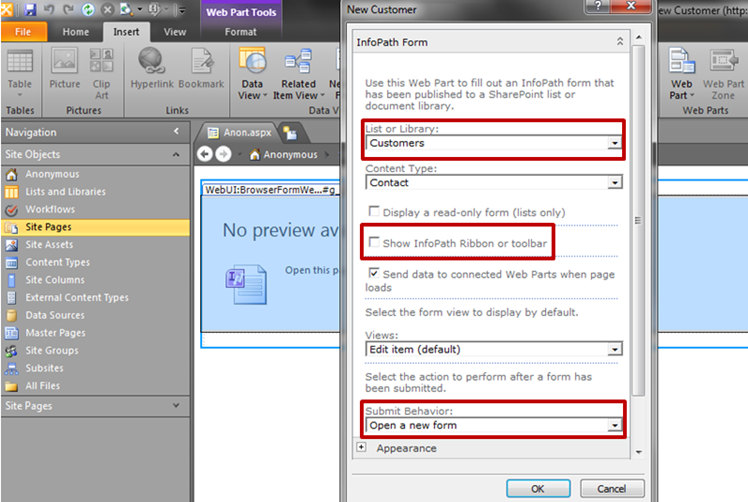 When doing any of the above, a new InfoPath list form template opens on your local machine, so be sure you have InfoPath 2010 installed. The template will have a basic table with all the list columns displayed. Likewise, all the fields are visible in the data source pane on the right (Fig. 16). Now, you can customize the form to make it look how you want, and you can even add data connections, but just be sure the users have permissions to the source of those data connections. My form below has a banner image, a thinner table for the default fields, a custom submit button, and a few repeating tables for showing secondary data from other lists on the site (Fig. 17). Notice that the anonymous user is able to open this form by clicking “Add new item.” I purposely right-clicked and chose “open link in new tab” to avoid the modal dialog, because you wouldn’t be able to see that the user is anonymous (Fig. 18). Notice also that the two repeating tables on the right are both populated with data from other lists (tasks list and the same Customers list). Notice below how I am an anonymous user, and I can see items submitted by both authenticated users and anonymous users (Created By is blank). So, you can already see that anonymous users can easily submit to lists using InfoPath forms, but I’m going to show you one more step so that you see it can all be done through the InfoPath Form Web Part through a guided interface instead of the user going directly to the list. 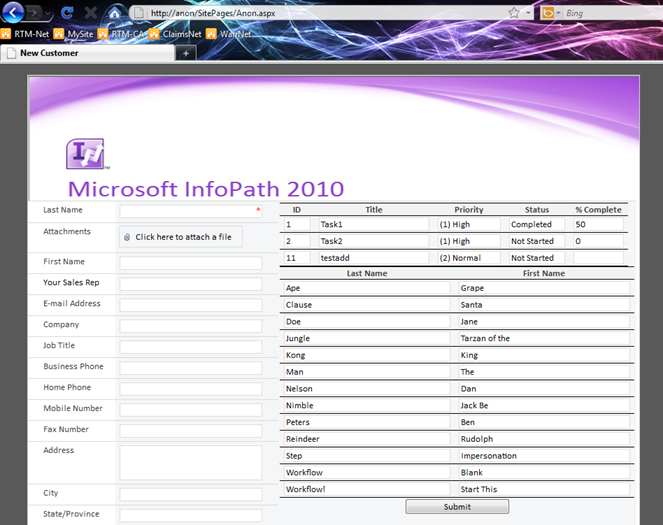 First, let’s create a custom page with nothing on it except the InfoPath Form Web Part. This part of the blog is something I just now built to demonstrate, so it has no design elements at all – I’m just showing an example – but you can probably get very creative for your anonymous users so that they only see what you want them to see. To create the type of page I’m using, open the site in SharePoint Designer 2010, click on the Site Pages Site Object (left navigation), and in the ribbon click New > Page > ASPX. This creates a new, blank page with nothing on it. Click on the page to get to the page settings, and then click Edit File. This will show you the InfoPath Form Web Part properties so that you can connect it to the Customers list. Notice that I have disabled the ribbon so that the user can only utilize my custom Submit button, and I have configured the submit behavior to open a new (blank) form upon submit. What this does is insert the data to the list and then present the user with a fresh, new, blank form (Fig. 21). Now, you just save the form and send that page’s direct URL to the anonymous user. When the anonymous user clicks on the link, this is the result (below). Notice the page opens in the browse with nothing else visible – no ribbon, no master page, no border or other miscellaneous indicators (Fig. 22). You could also add other web parts – either hidden or shown – that are connected to this form for input and/or output purposes, such as a Query String Filter Web Part that could read from the URL and insert that data to the form, which could then trigger rules and/or switch views to provide a personalized experience. Since there is no indicator in Figure 22 for which user that is, I am providing a bonus screenshot below that shows the same technique utilized on the Home page of my Anonymous site (Fig. 23). That’s all there is to it. This is very easy to set up and works very, very well. Unfortunately, items submitted by anonymous users can’t automatically trigger workflows, so I’m hoping that will either be changed in the future or that we’ll be able to figure out a way (without code). Even so, this gives you a great way to provide a powerful, nice-looking interface to your anonymous users so that they can submit data using a logic-filled form without the need for custom code or any heavy customization.